Check out Tobi's Lace Up To It Velvet Dress Edge and elegance collide in the Black Lace Up To It Velvet Dress. Seriously, you're going to love the ultra soft velvet on this classic bodycon fit. But there isn't anything classic about those statement lace up sleeves that are so irresistible. Your evenings just got a whole lot sexier. Edge and elegance collide in the Black Lace Up To It Velvet Dress. Seriously, you're going to love the ultra soft velvet on this classic bodycon fit. But there isn't anything classic about those statement lace up sleeves that are so irresistible. Your evenings just got a whole lot sexier. Edge and elegance collide in the Wine Lace Up To It Velvet Dress. 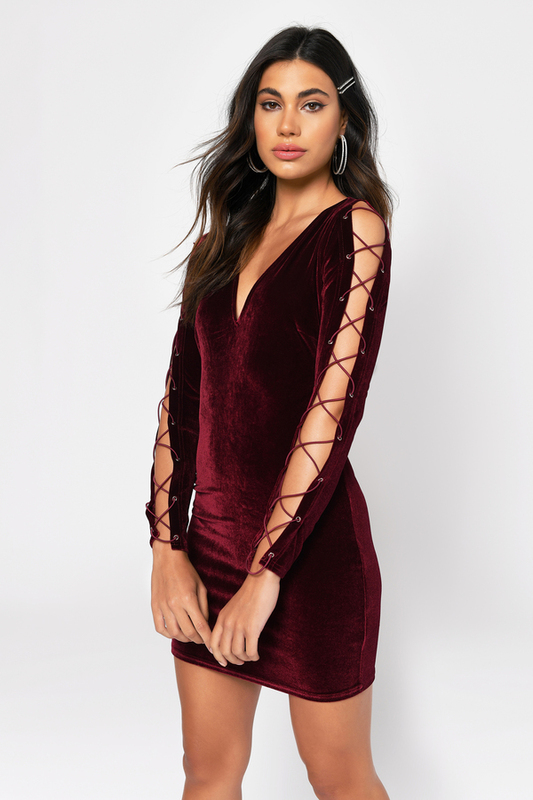 Seriously, you're going to love the ultra soft velvet on this classic bodycon fit. But there isn't anything classic about those statement lace up sleeves that are so irresistible. Your evenings just got a whole lot sexier.